“In our system, we render fat from the cattle to make soaps and salves, sell trim to processors, tan hides, make pet chews, and feed our guardian dogs. Even after all of these measures are taken to use all parts, there are still 4 million pounds of animal remains each year that we can not process or use. So, we do the next best thing: We gather the bones, heads, feet, intestines, feathers, and stomach contents to utilize in our compost program. Composting transforms raw residuals through soil microorganisms. White Oak Pastures’ compost is used as a soil amendment ingredient and natural fertilizer that helps eliminate pathogens. Furthermore, composting increases microbial activity, soil fertility, and cation exchange capacity, while also improving water retention in sandy soils and soil structure in clay soils. Compost enhances the plant’s ability to suppress diseases and reduces the bioavailability of heavy metals. It allows us to manage our “waste” locally, sequester carbon, keep nutrients on the farm, and produce a valuable soil amendment to remediate new pastures. At our beef plant, Daverian Griggs places all our waste through a grinder and applies a dose of lactobacillus before hauling it to the compost field. Lactobacillus is an inoculant that is in the same family of bacteria that turns milk into yogurt and speeds up the composting system. In a traditional composting system, oxygen and heat are used to break down material and kill harmful pathogens. Turning your compost piles every couple of weeks is what makes this process work. In our lactobacillus method, those bacteria break down material and a low pH kills harmful pathogens. This system works in an anaerobic environment, which means we don’t have to continually turn the piles, which saves time, equipment, and diesel fuel. In a well-balanced compost system, a nitrogen source is mixed with a carbon source. In our case, the animal material is high in nitrogen, so we mix it with peanut hulls that have been cleaned at a local peanut processing plant. These hulls are a “waste” product from the peanut plant. With the right balance, everything in the compost pile has something to feed off of and is processed quickly without a strong odor. 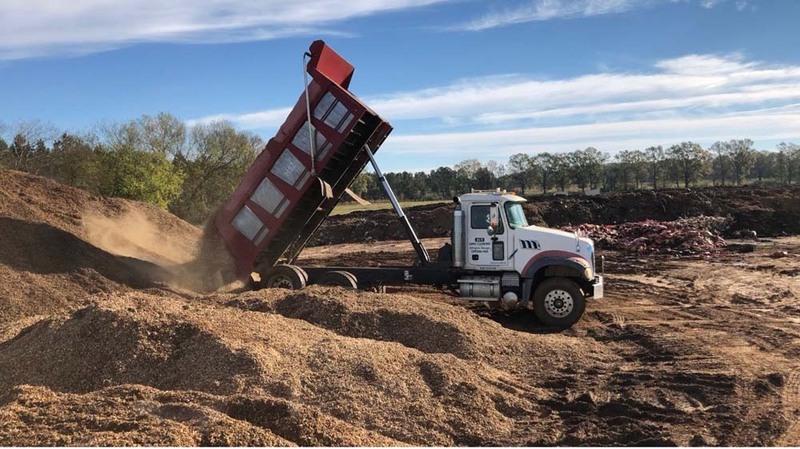 After 12 weeks, we turn the pile over once and let it sit for at least 6 months to be certain that all harmful bacteria and pathogens have died off. The finished compost is then spread on our pastures, and it is an invaluable resource in regenerating the land.